In the 1920s, General Estienne was looking for vehicles that could replace the mounts of the Mehari units in the Sahara Desert. First he looked at caterpillar tracks. But he was disappointed in their performance on rocky ground so he asked Louis Renault to design a vehicle specially for the desert. Renault came up with a 6-wheeler model that had a rear two-axle drive, high clearance and 4 drive wheels at the back. Low-pressure tyres meant good road adherence. 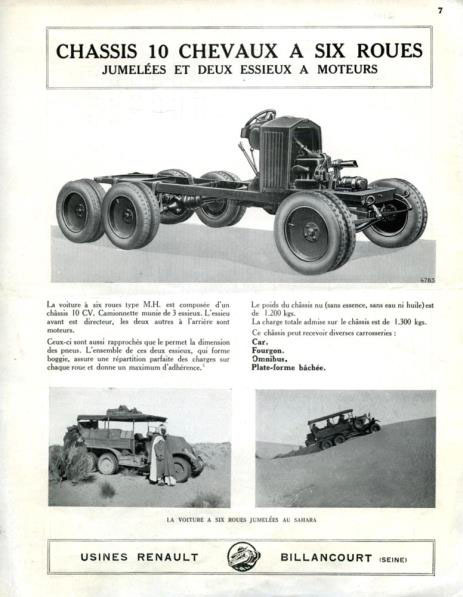 On 25 January 1924, three Renault 6-wheelers competed with three Citroën tracked vehicles on the dirt road between Colomb-Béchar (Algeria) and Bourem (now Mali), covering a total distance of 2,400 kilometers in 7 days.